Our picnic rides are perfect for couples, family activity or days out with friends. The thrill of horse riding mixed with the stunning views and beautiful picnic location at our mountain side cabin, make for an unforgettable experience. But don’t take our word for it, have a look at the pictures or check out our trip advisor reviews! *A 15 stone (95kg) weight limit may apply to all riders depending on the availability of our larger horses. *A 20% deposit may be asked for upon booking. 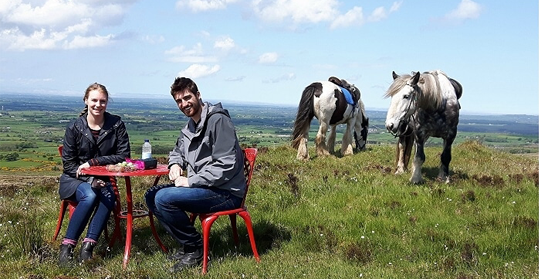 Venture out into the North Antrim hills on horse back and enjoy a mountain top picnic at the most extensive off-road riding centre on Ireland’s North Coast. You’ll leave the low land pastures behind, ride through streams and out into the heather clad slopes of the Slieve an Orra. Stop off for half an hour to enjoy your picnic at the lookout point, and take in the panoramic views over 5 counties before riding back down to the centre. Suitable for all levels of riding ability from total beginner to experienced riders. *Picnics are not included in the price. You can bring your own or our catering team can provide a high quality picnic or afternoon tea. This should be pre-ordered when booking. When booking a picnic, you need to make us aware of any special dietary requirements in your group. This off road trail takes you horse higher and further out into the beautiful North Antrim Hills of Northern Ireland. With 360 degree panoramic views, this must rate as the best view in Northern Ireland if not the whole of Ireland. 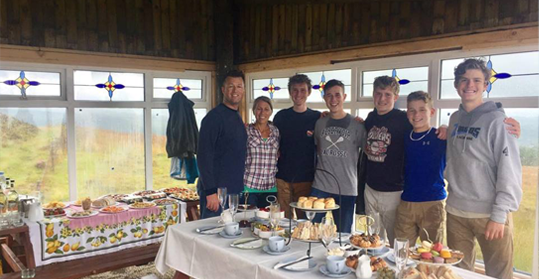 Once at the top, enjoy your picnic and take in views over the Glens of Antrim looking north to Scotland’s Ayrshire Coast, Mull of Kintyre (home to Paul Mc Cartney’s famous song) and Highlands and Western Isles of Scotland. It also looks out over Rathlin Island and on to Inishowen and Malin Head in Donegal the most northernly point in Ireland; then west across the River Bann to the Sperrin Mountains and south to the Mourne Mountains in Co Down Northern Ireland and to Slieve Beagh in Co. Monaghan which is in Southern Ireland.